Primary sources are the eye witnesses to history. They are first hand accounts that historians examine in order to better understand the past. At the Augusta Museum of History, our mission is to collect and preserve primary sources. At the Museum, we encourage schools, groups, and visitors to examine these objects and materials and form their own understanding of the history of the Augusta river region. Below are some tools to help better analyze the museum's resources. The Augusta Museum of History also provides a primary source program for visiting schools and tour groups. This program is available upon request. Groups can request a primary source workshop concerning Augusta during the Industrial Revolution or World War I. The program is approximately one hour long and gives visitors access to reproductions of the Museum's archival collections. The Industrial Revolution program asks students to evaluate the impact of the Industrial Revolution on Augusta. The World War I program uses stations to show the many facets of life in Augusta during the First World War. These programs utilize the Inquiry Method, which applies the scientific method to history. It encourages students to engage with artifact to answer questions about the past. Through exploration and hands on discovery, children of all levels and ages are able to better understand historical concepts. Click on Our Primary Source Guide Below to Learn More! 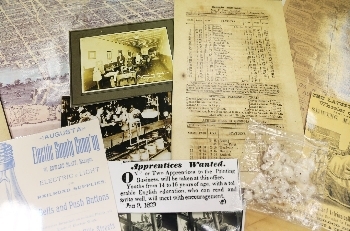 Children will use primary source artifacts such as newspapers, cotton, maps and pictures to discover how Augusta changed during the Industrial Revolution. Best for older children and younger children should be supervised. Children will become history detectives and learn about Augusta's involvement in WWI through examining letters, posters, photos, and newspaper articles. This activity is aimed at older children with good reading ability.